Amaretto is one of my favorite liqueurs. The flavor of almonds is just delicious and I use them all the time in recipes for both food and drinks. 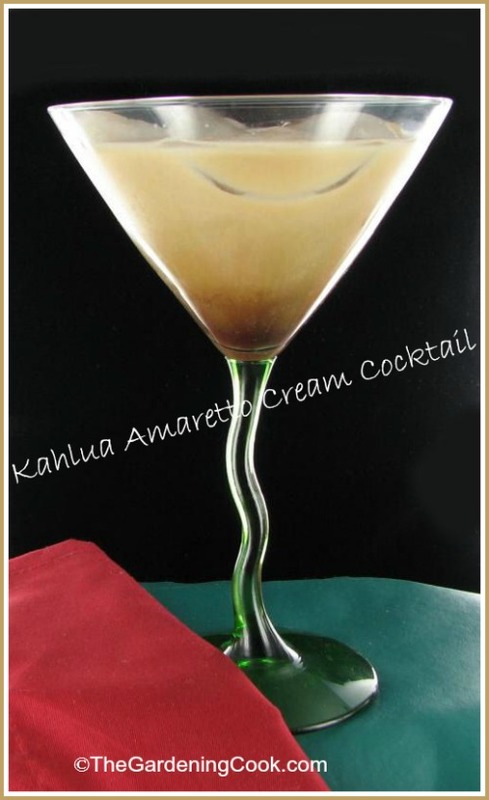 This Kahlua Amaretto cream is a great cocktail recipe that is perfect to serve at a cocktail party. This Toasted Kahlua Amaretto cream Cocktail is creamy and delicious. Not all good cocktails contain spirits. Sometimes, they are a nice blend of liqueurs. Amaretto is a sweet almond flavored Italian liqueur. It is made form a base of apricot pins or almonds, and sometimes both. This lovely cocktail combines amaretto with the richness of Kahlua and cream for a rich and decadent cocktail. You can also make it with skim milk or even Silk vanilla soy milk, which is good too. The drink won’t be as thick but is still delicious and saves calories. For more great cocktail recipes, please visit my Cocktail Hour Board on Pinterest. This Kahlua Amaretto cream is a great cocktail recipe that is perfect to serve at a cocktail party. Place ice in a martini glass. Add kahlua, amaretto and cream to a shaker and shake well. Pour over ice in a glass. Enjoy!